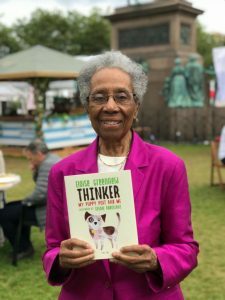 Tiny Owl’s Thinker Puppy Poet makes a big splash at Edinburgh Book Festival! You are here: Home / Tiny Owl’s Thinker Puppy Poet makes a big splash at Edinburgh Book Festival! 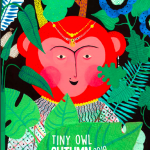 Tiny Owl recently flew to Edinburgh Book Festival to celebrate our recent books and authors! 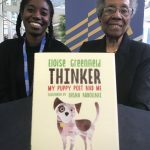 Among them was the award-winning poet Eloise Greenfield, author of Thinker: My Puppy Poet and Me! We were thrilled that she came all the way from the United States so that festival-goers could enjoy fascinating insights into her work. 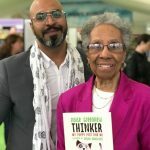 Eloise has written about 50 children’s books, but we are excited to say Thinker will be the first published in the U.K! She has kindly shared with us her recollections of this amazing event. Read her wonderful words below! 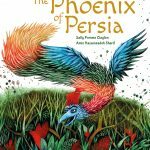 When I was invited by Tiny Owl Publishing to participate in the 2018 Edinburgh International Book Festival, I knew it would be exciting. After I checked with my daughter, Monica, who would travel with me because of my partial blindness, the dates of my visit were set. The publisher then made travel and accommodation arrangements. I was asked to write a piece for The Freedom Papers, the book that would be published during the festival. Writers were asked to write on any aspect of freedom, whatever they chose to do. At first, I thought about the joy of the Emancipation Proclamation, the freeing of enslaved people in the United States. Then I thought about the grief of freed people who went looking for their loved ones who had been sold away. I also thought about the lasting physical injuries that were the result of beatings. I wrote the poem, “Jinny’s Freedom,” to reflect these inhumanities. I was scheduled to do three programs – two for children with renowned illustrator, Ehsan Abdollahi, who illustrated my picture book, Thinker: My Puppy Poet and Me, and one for adults with the highly regarded young poet, Victoria Adukwei Bulley, neither of whom I had met. Ehsan and I finally were in contact at our first program in Edinburgh, and Victoria and I were first in contact, briefly, by email a few months earlier. In the meantime, my job was to think, as I always do, about what I wanted to say to the audiences. What is my mission? Who are Jace and Thinker? How do they feel about words and poetry? 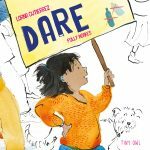 My primary mission is to let children know, through literature, how wonderful they are and how much they are loved. I also want them to know that they are intelligent and beautiful, that they should learn many things, pay attention to what they are feeling as they learn, and allow those feelings to lead them to their life’s work and a satisfying life. Eloise met fab poet Victoria Adukwei Bulley! Thank you Eloise! Here are some lovely photos from Edinburgh Book Festival! Click on each photo to enlarge. None of my previous books, except Childtimes: A Three-Generation Memoir, which my mother, Lessie Jones Little, and I wrote about our childhoods and my grandmother’s, are about me. In Thinker, however, the two main characters are very much like me, in their love for words and for putting words together in a way that is musical. The two-part poem, “Two Poets Talking,” expresses these feelings. The audiences were very responsive to the discussions and readings, and to Ehsan drawing onstage, before their very eyes. Their questions at the end were insightful. They asked: Why are some of the pets dancing when they visit the school? Why are Thinker and his puppy brother twins? 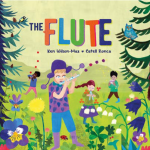 One child, at a booksigning, asked me how I felt when my first book was published. “I was thrilled!” I said, and the memory of it made me laugh. The child laughed, too, because he had anticipated my excitement. The entire festival was rewarding, many thousands of people – adults and children– expressing, in a beautiful setting, their love for books. I was tired when I returned home, but it was a satisfying kind of tiredness, as I remembered and relived all the special moments of the festival. Thinker will soon be published in the US!